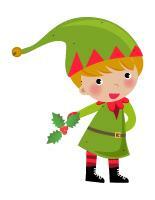 Role play ideas, crafts, musical activities and fun games for your little elves. Posters, a picture game, word flashcards, activity sheets, elf games, crafts, puzzles, and so much more! 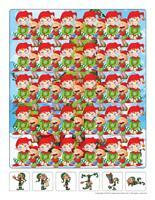 (Open thematic poster-The elves' workshop) Print, laminate, and decorate the walls of your daycare with all kinds of posters. 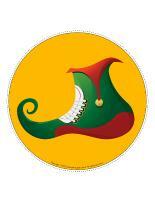 (Open educa-theme-The elves' workshop) Print and laminate the elements representing the theme. Display them to present your theme to the children in your group (and their parents). 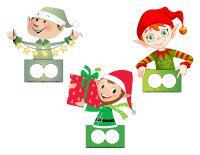 (Open educa-decorate-The elves' workshop) Print, laminate, and cut out. Use the illustrations to decorate the walls of your daycare and set the mood for your theme. 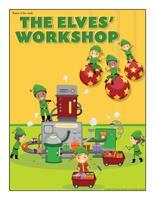 (Open educa-numbers-The elves' workshop) Print and laminate the posters. Display them on a wall to decorate your daycare throughout the theme. 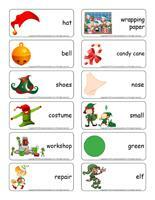 (Open educa-letters-The elves' workshop) Print and laminate the posters. Display them on a wall to decorate your daycare throughout the theme. This special tool was created in response to a special request received. 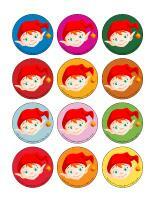 (Open group identification-The elf group) Print and display in a specific location or in your circle time area. Every morning, deposit an elf somewhere in your daycare and encourage children to find it. As soon as they find it, photograph it and print the picture. Display all the pictures on a special wall near your daycare entrance or cloakroom. Children will enjoy showing their parents where the elf was hidden at the end of each day. Wear an elf hat to greet children each day. Name a chief elf every day. Give the chief elf certain privileges and tasks. The pictures may be used as a memory game or to spark a conversation with your group. Use them to decorate your daycare or a specific thematic corner. (Open picture game-The elves' workshop) Print, laminate, and store the pictures in a Ziploc bag or in your thematic bin. (Open writing activities-W like workshop) Print for each child or laminate for use with a dry-erase marker. 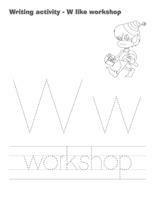 (Open stationery-The elves' workshop) Print. 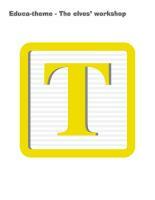 The stationery can be used to communicate with parents, in your writing area, or to identify your thematic bins. 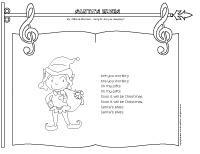 (Open activity sheets-The elves' workshop) Activity sheets are suggested for each theme. Print and follow instructions. Decorate tiny buildings ("Fisher-Price" or others) with ribbons, miniature garlands, etc. Have a wrapping workshop. Provide wrapping paper, ribbon, tape, and small boxes. Add decorative accessories related to the theme such as confetti, pipe cleaners, ribbon, etc. Organize an ornament workshop. Have different sizes of pinecones, cotton padding, Christmas-coloured fun foam pieces, died pasta pieces to make garlands, Mac-Tac to create original stained-glass windows, ribbon, and cardboard on hand. Santa's toy workshop-hats, ears, tutus, tights, colourful socks, pointed shoes, bracelets, necklaces, and small bells for the elves. A hat, beard, boots, belt, and red costume for Santa. A headband with antlers and red makeup (or a clown nose) for Rudolph. Your workbench and tools can be used to build and repair toys. Christmas morning-pyjamas, wool stockings, slippers, pretend gifts which may be unwrapped (ask parents for leftover wrapping paper), pretend food items to make breakfast, a beautiful Christmas tablecloth and decorative plates, snowflakes for decorating windows, laminated pictures of festive breakfasts, reunited families, etc. Beautiful Christmas cards can be manipulated and admired, musical ones are great! Bake sugar cookies. Children love measuring, calculating, pouring, etc. They can even make their favourite shapes. A nice cup of hot chocolate! Mmmmm. 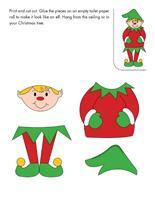 (Open finger puppets-The elves' workshop) Print and laminate the puppets. Cut out the holes so children can insert their fingers. They will enjoy creating stories with the puppets. 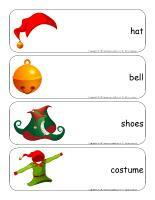 (Open felt board-The elves' workshop) Print the different elements and glue them on felt. Glue four pieces of black felt on a large piece of cardboard to make a felt board. Display your felt board on a wall. The felt shapes will stick to the felt board. Children will enjoy moving them around to create scenes and stories. (Open elf path) Print several copies. Use the illustrations to create a path that leads to the areas within your daycare children visit most throughout the day (cloakroom, bathroom, table, etc.). (Open game-This is my spot-The elves' workshop) Print two copies. Laminate and cut out the cards. Glue one copy of each card on the table using adhesive paper. Drop the other copies in a bag. Children take turns picking a card to determine their spot at the table for the day. You may also use the cards to determine naptime spots or for your task train. 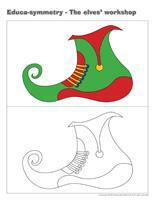 (Open lacing-The elves' workshop) Print, laminate, and punch holes around the contour of each model. Children can use string, a shoelace, or ribbon to lace the shapes. (Open game-Elf) Print, laminate, cut out the pieces, and glue the elf on the wall. Give one laminated bell to each child. Blindfold one child at a time and have them try to stick their bell as close to the correct spot on the elf's hat as possible. Set your parachute on the floor. 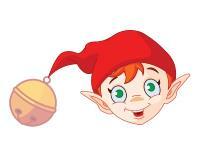 Deposit elf hats and tiny bells on it and invite children to each hold one parachute handle. When you give the signal, children must shake the parachute as strongly as possible to send the elf hats and bells flying in the air. This activity requires an elf hat and a scarf. Have your group stand in a circle. One child becomes the elf and stands in the centre of the circle. 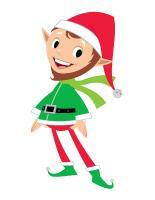 The elf wears the elf hat on his head and hides his/her eyes with the scarf. Sing a Christmas song with your group. As you sing, tap a child's head. This child steals the elf's hat and hides it behind his/her back. The other children place their hands behind their back too. When everyone is ready, tell the elf he/she can remove the scarf. Have the elf look around the circle and try to guess who stole the elf hat. If you wish, you may provide clues. Once the elf has discovered who stole the hat, the child holding the elf hat stands in the centre of the circle for the next round. Select a child to play the role of Santa Claus. The other children are elves. The elves are lazy and often run away from Santa's workshop. For this reason, Santa must catch the elves so they can go back to work and continue to prepare for Christmas. Hide one or more elves in your yard. When you give the signal, children set off to find them. Every time a child finds an elf, he/she must give it to you. Once all the elves have been found, hide them all over again. Play music and encourage children to dance around the daycare. You are Santa Claus. When you touch a child with your magic wand, they become elves and must stand still. When you touch them again, they may resume dancing. Deposit several hula hoops on the floor. The elves walk around the hula hoops, to the sound of Christmas music. When the music stops, each little elf must find a home (a hula hoop). Remove one hula hoop at the end of each round, just like in musical chairs. Variation for younger children: To the sound of music, invite children to hop from one hula hoop to the next. Hold babies in your arms and hop with them. Have children wear an elf hat. Add a garland strip to the tip of each child's hat and apply blush to their cheeks and the tips of their nose. Provide musical instruments and parade around your daycare. Don't forget to take pictures! Variation for younger children: For very young children, an elf hat, a red nose, a musical instrument and Christmas music are all you need to have loads of fun. (Open educ-intruder-The elves' workshop) Print and laminate. Children must find the six (6) intruders in the scene. (Open educa-symmetry-The elves' workshop) Print. Children must color the bottom picture (black & white) to make it identical to the top picture (in color). (Open educ-pairs-The elves' workshop) Print. Children must color identical items using the same color or draw a line between them. For durable, eco-friendly use, laminate for use with a dry-erase marker. 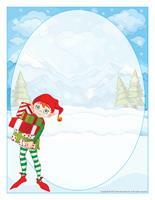 (Open educ-differences-The elves' workshop) Print and laminate for durable, eco-friendly use. 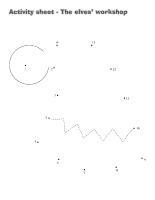 Children must identify the differences between the two illustrations and circle them with a dry-erase marker. (Open puzzles-The elves' workshop) Print, laminate, and cut out the pieces. Children must place the pieces correctly to recreate the scenes. Children pretend they are elves repairing and wrapping toys for Christmas. They can also create new toys with building blocks or recycled materials. To make this activity last even longer, children can act out the most popular toys such as a doll, a fire truck, a puppy, etc. 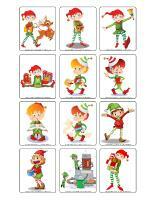 (Open dress-up dolls-The elves' workshop) Print and laminate. Leave all the pieces on a table. Children will enjoy dressing the elf over and over again. Elf costumes and hats are often decorated with tiny bells. For this reason, this theme is perfect for exploring tiny bells and the gentle sounds they produce with your group. Drop one tiny bell in a plastic container (peanut butter) and put the lid back on. Can you hear the tiny bell? If I hold a tiny bell firmly in my hand and shake it, can I hear it? If I bang two tiny bells together, will this produce the same sound as when I shake a single tiny bell in my hand? If I drop one tiny bell in a glass of water and stir, will I hear the bell? Do several tiny bells produce a louder sound than a single tiny bell? If I throw a tiny bell, does it produce the same sound as when I shake it? 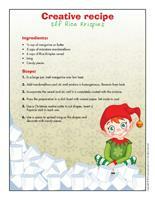 (Open creative recipe-Elf Rice Krispies) Print. In a large pot, melt margarine over low heat. Add marshmallows and stir until mixture is homogeneous. Remove from heat. Incorporate the cereal and stir until it is completely coated with the mixture. Press the preparation in a dish lined with waxed paper. Set aside to cool. 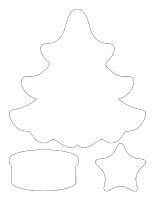 Use a Christmas cookie cutter to cut shapes. Insert a Popsicle stick in each one. Use a spoon to spread icing on the shapes and decorate with candy pieces. Prepare the two boxes of cake mix as indicated on the package. Divide batter among several bowls. Add a different color of food coloring to each bowl. Deposit paper muffin cups in each section of a muffin tin or, if you prefer, grease each section of the muffin tin. Have children drop small spoonfuls of different colors of cake batter in each section of the muffin tin. Set aside to cool. 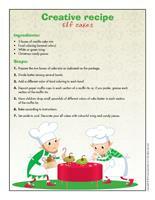 Decorate your elf cakes with colourful icing and candy pieces. 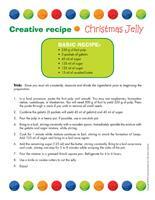 (Open creative recipe-Christmas jelly) Print. Trick: Since you must stir constantly, measure and divide the ingredients prior to beginning the preparation. In a food processor, purée the fruit pulp until smooth. You may use raspberries, honeydew melon, cantaloupe, or blueberries. You will need 300 g of fruit to yield 250 g of pulp. Press the purée through a sieve if you wish to remove all small seeds. Combine the gelatin (3 packets will yield 45 ml of gelatin) and 45 ml of sugar. Pour the pulp in a heavy pot. If possible, use a non-stick pot. Bring to a boil, stirring constantly with a wooden spoon. Immediately sprinkle the mixture with the gelatin and sugar mixture, while stirring. Cook for 1 minute while mixture continues to boil, stirring to avoid the formation of lumps. Add 125 ml of sugar and bring to a boil once again. Add the remaining sugar (125 ml) and the butter, stirring constantly. Bring to a boil once more and cook, stirring non-stop for 5 to 8 minutes while scraping the sides of the pot. Pour the mixture in a greased 8-inch square pan. Refrigerate for 4 to 6 hours. Use a knife or cookie cutters to cut the jelly. Purchase tea biscuits (Social Tea) and assemble them by sticking them together with icing to form a small house. When you are satisfied with the shape of the house, spread icing all over and let children decorate it with candy pieces. Variation for younger children: Avoid using candy pieces that are very small. If you wish, you may use pudding to hold the cookies together instead of icing. You may even offer larger cookies to limit manipulations. Of course, have several wet facecloths on hand to clean little hands (and faces)! (Open puppets-The elves' workshop) Print the models on heavy cardboard. Have children cut them out and decorate them with a variety of materials. Glue a Popsicle stick behind each model to create puppets. (Open models-The elves' workshop) Print. Use the models as needed for a variety of crafts and projects throughout the theme. (Open models-The elves' workshop) Print the color or black and white version. On heavy cardboard, trace and cut out the shapes you wish to use. Keep only the contour of each shape. Glue a piece of cellophane paper over the cardboard frame. Glue glitter all around the contour. Stick your stained glass in a window. Variation: Trace the shapes on adhesive paper and fill them with confetti, tissue paper, pieces of construction paper, etc. Stick a piece of adhesive paper on top and cut out. Hang your stained glass in a window or door. (Open models-The elves' workshop) Print the color or black and white version for each child. Have them tear and crumple pieces of green, red, and white tissue paper and use the crumpled pieces to fill the shape they prefer. (Open miniature elf) Print, cut out, and color. Glue the pieces on an empty toilet paper roll to make it look like an elf. Hang from the ceiling or in your Christmas tree. (Open models-The elves' workshop) Print the color or black and white version. 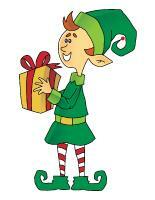 Let children decorate the elves with glitter, paint, and other materials. 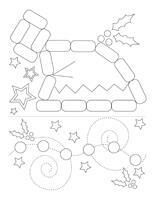 Cut them out and assemble them to form a garland you can hang within your daycare or near your daycare entrance. (Open my elf) Print for each child. Have children cut out the various parts and color them. Assemble them with fasteners when they are done. 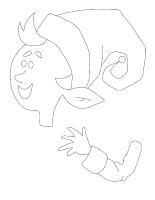 (Open coloring pages theme-The elves' workshop) Print for each child. Use a hole-punch to make holes along one side and join the pages together with ribbon. Throughout the month of December, have children color the pages. This coloring book will make the perfect gift for parents. 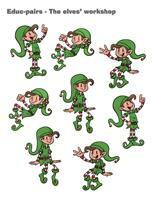 (Open I am learning to draw-An elf hat) Print and laminate the model sheet. Invite children to practice their drawing technique on the model sheet. Later, they can try to draw an elf hat on their own. (Open complete the drawing-The elves' workshop) Print for each child. Encourage them to complete the drawing. Sung to: Are you sleeping?